FastCGI functionality is very similar to working of CGI. FastCGI makes differences at few places than CGI like FastCGI processes are persistent and they can handle more than one requests per processes. FastCGI allows running programmes on remote machines by multiplexes the environment information, standard input, output and error over a single full-duplex connection. Read more about FastCGI. This tutorial will help you to setup Apache web server with PHP and FastCGI on Red Hat based systems. Fast of all, enable REMI and EPEL yum repositories on your system. These repositories provide lastest packages for RedHat based systems. Apache2 packages are available with name HTTPD for Redhat based systems. You can use following commands to install latest available Apache2 (HTTPD) packages in configured repositories on your system. After installing Apache web server, let’s install PHP and FastCGI Apache module on your system. You can install any version of required PHP or simply use the following command to install available PHP packages. This tutorial doesn’t include installing PHP modules, So you can also install required PHP modules. Before using PHP/FastCGI handler, you have to disable default PHP handler on your system. Edit PHP configuration file for Apache (/etc/httpd/conf.d/php.conf) in your favorite text editor and comment following lines showing in below screenshot by adding the hash (#) sign at the start of the lines. At this point we have successfully installed Apache FastCGI Module. Now nagigate to /var/www/cgi-bin directory, If not exists create directory. Then create a php.fastcgi file and add the following content to this file. Also make sure the php.ini file and php-cgi exist on your system. 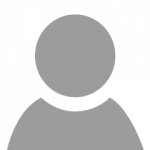 Change permissions of php.fastcgi script to make it executable by Apache server. Finally, create a VirtualHost in our Apache configuration file with FastCGI support. VirtualHosts are used to configure multiple sites with single IP. Below configuration will allow siting svr1.tecadmin.net with any system IP on port 80. At this point, you have completed Apache configuration with FastCGI support. Let’s restart Apache server using the following command. 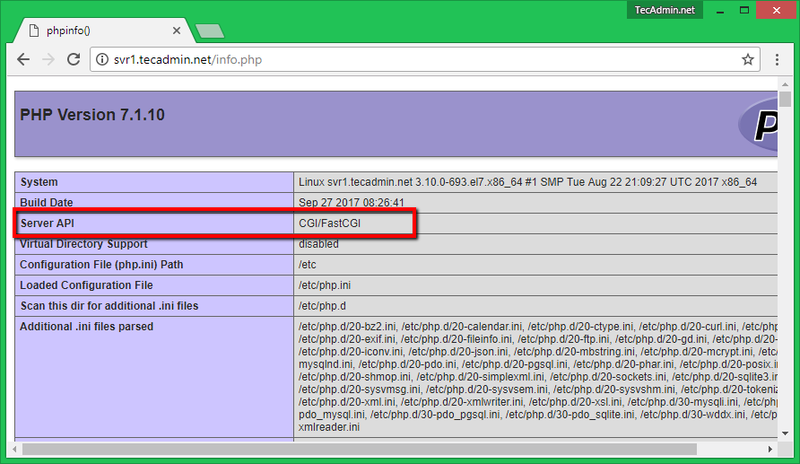 Now create a file in your document root /var/www/html/info.php and add following content to check detailed php information. Access your Apache server using IP address for domain name followed by php.info file in your web browser like below. This will show the current configuration of PHP in your system. Look the value of Server API option, if you get this value CGI/FastCGI, it means server is properly configured to use FastCGI. Hi RAHUL I have proved your steps and I have got accomplished it, however I was asking me how could run multiple PHP versions on the same Apache instance in an server with ServerName established? I hope you could help me, because I have proved some tutorials in the web but none helped me to acommplished it. Step 4 is reason for not showing .php files?! … when I uncomment the lines it works but then Server API is Apache and not CGI/FastCGI. Some must be wrong with the above tutorial. Yes, we comment these lines, So that Apache use FastCGI as default Server API. What issue are you facing with CGI/FastCGI? I notice using “AddHandler php5-fastcgi.php” and “Action php5-fastcgi /cgi-bin/php.fastcgi” doesn’t work in me. It always gives me an Internal Server Error when running a PHP. Your insight on this topic and help will be appreciated by me and many others. Hi, being around in the internet long enough makes you aware that tons and tons of tutorials out there won’t really work, probably cause they weren’t clear enough about their environment. But this one, this one worked! Thanks for the guide! It worked, i put a phpinfo() in the index page then everything i wanted to see was there. Kudos! No reply like the other question above? Nvm, i found the answer and fixed it. all i did was change ownership and permissions on the folders. *For the paranoid and suspicious developer (in a good way), the solution above was tested. Hope this helps someone out there who was just as stumped as meh! This guide really helped me. I was able to put multiple php’s on my apache. thanks a MILLION!!! I am going to create a guide for what I did, I can send you a copy if you would like. I have some other things I want to try but that can wait for later. hello thank you for your reply..
how do I confirm the replacement? Are you facing any error with this configuration ?